Carlos Vasquez, MSM, RT(R), CRA, FAHRA, is division director of radiology services for St Elizabeth Regional Health in Lafayette, Indiana. In that capacity, he is responsible for the operation and management of two hospitals’ radiology departments (St Elizabeth East and St Elizabeth Central), two satellite breast imaging centers, and a radiation oncology center. His roles with AHRA include serving on the organization’s executive committee since 2009 and its board of directors since 2005. Radiology Today (RT): How long have you been working in imaging? Vasquez: I have been in imaging for 22 years. My first three years were spent as a radiologic technologist, then I moved to management. RT: From your perspective, what has changed the most in radiology over those 22 years? Vasquez: One of the things that changed the most is clinical informatics technology. We used to deal with the clinical demands of waiting for technology to catch up. Now we have the opposite situation, where clinical demands are trying to catch up so that we can better utilize information technology currently available. Also, there have been quantum-leap advancements in CT scanners that I could not have even imagined 20 years ago. However, with breakthrough developments in technology come unpredicted consequences. For example, in the case of CT, concerns have been raised regarding radiation doses. But equally important has been the swift response from the entire imaging industry and OEMs [original equipment manufacturers] investing responsibly and implementing solutions to reduce radiation dose. There has also been an increase in regulation and a continued and progressive involvement from our government. While this is right and necessary when the aim is quality and safety, on occasion it has led to an unrealistic reduction on reimbursement, such as the imaging provisions in the Patient Protection and Affordable Care Act (PPACA). RT: The imaging industry has always been aware of dose concerns. However, the level of awareness among people outside the imaging community has grown tremendously in recent years. How has that affected imaging administrators? Vasquez: The benefits have and always will outweigh the risk of radiation. Unfortunately, the handful of well-publicized incidents has given the imaging community an unfair image. We have always been conscious of radiation levels in radiology and work with technologists, radiologists, and physicists to develop and implement best imaging protocols to reduce radiation dose without image degradation. Once the general public became more educated and began asking more questions about radiation doses, we responded by developing educational materials and having technologists and imagers talking to patients about radiation dose and engage with the community at local levels talking about the facts of radiation dose for each modality and per each exam. Additionally, the imaging industry is profoundly united on these efforts. There isn’t one professional or vendor in the field who isn’t working on reducing dose or educating all stakeholders. RT: What do you see as the top two or three challenges that you and your colleagues face as imaging administrators and directors? Vasquez: While this isn’t a new challenge, something we face year after year is the consistent issue of reductions in reimbursement. Operational costs do not decrease; however, inexplicably, payers decide to decrease imaging reimbursement while increasing their premiums. Another challenge is technology obsolescence. How do we replace, upgrade, or implement new technology when our organizations have less capital resources to invest and a greater competing service need for available capital? This will continue to keep us up at night; we work in a technology-driven field. If we don’t invest in staying up-to-date in technology, the speed of diagnosis, treatments, and overall clinical outcomes could be adversely impacted. We also need to develop and use better imaging operations benchmark data. We need data to measure operational efficiency and workflow processes. AHRA is committed to this endeavor with its real-time data gathering and reporting intelligence tool Datalynx. We must continue our efforts to reduce expense, eliminate duplication, improve quality outcomes, and improve patient care and patient satisfaction. Value-based purchasing is all about clinical outcomes and patient satisfaction. This is a win for all and could provide a competitive edge and increase patients’ loyalty. RT: As you know, the US Supreme Court largely upheld the PPACA, including the individual mandate. How do you think this will affect imaging in the short and long term? Vasquez: For the immediate future, there are a couple provisions that directly impact imaging reimbursement, particularly the assumption of 75% imaging equipment utilization and up to 50% reduction in the technical component of multiple procedures in advanced imaging. In the long term, we are certain that imaging volumes will increase due to the fact that millions or more Americans will be insured. Our challenge will be how to increase capacity without adding additional expense or getting additional revenue. We will need to be creative to develop an operational model to function under the PPACA, if fully implemented. The imaging industry as a whole has been proactive in reducing operational expenses and forming partnerships directed at reducing unnecessary utilization. Additionally, we are acutely aware and actively participating in the triple aim of accountable care organizations: better health, higher quality, and lower cost. RT: For people who obtain commercial insurance—because the law restricts insurers’ ability to deny coverage or because it forces people to purchase it—the insurance should pay for care. However, there are important unanswered questions regarding issues such as Medicaid expansion. Vasquez: Absolutely. Another concern is how businesses will continue to provide insurance. Will companies choose to pay the penalty for not providing insurance coverage or will they incur the cost of providing coverage to their employees? How much will those costs differ? This also speaks to the issue of whether businesses will provide insurance to attract and keep good employees to remain competitive. We’ve only seen the tip of the iceberg on this one. 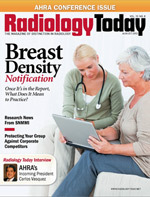 RT: What trends do you think will shape radiology in the coming years? Vasquez: I believe that radiation dose reductions will continue to be a hot topic. Rightfully, the entire industry is working in concert with OEMs in developing dose reduction tools inherent to equipment. We are now seeing the next-generation software integrated with existing workstations to allow for lower dose protocols while improving image degradation. Imaging utilization will continue to be a target. We will continue to see initiatives directed at reducing unnecessary imaging procedures; hopefully it will be the imagers and medical industry driving this effort. Undoubtedly, we will be talking of the passing of the PPACA and its impact on imaging. It’s an election year and both parties will make this an issue of their respective campaigns. RT: From your perspective, what do radiology groups need to focus on to provide good service and maintain a good relationship with their hospitals? Vasquez: I believe radiology groups are becoming more engaged with hospital operations. I have seen a trend in my organization where radiologists are members of clinical operations committees in addition to their traditional medical executive committees. Hospitals place great efforts on improving level of service, including the patient experience. In this environment it’s tremendously beneficial to have the radiologist abandon the traditional workday of spending their time in a reading room and come out to greet their patients. I know their time is valuable, but the occasional shaking of hands with patients would be a tremendous pillar in the hospital’s efforts to satisfy patients and improve services. RT: How would you implement that approach? Vasquez: That is a tough question. Obviously, radiologists are under pressure from their groups to meet productivity benchmarks. Radiology groups and hospitals need to make this part of their agreement and reach consensus on time allocated for this effort and address it financially so it can be done without adverse implication on radiologists. Radiologists have been typically known to foster good relationships with referring physicians; it would be equally beneficial if this would be extended to patients. RT: As long as they’re paid per interpretation, that will be a hard sell. Speaking of payment, have any reimbursement models other than fee for service had much effect on your market in Indiana? Vasquez: Very much so. I believe it is a national trend. Value-based purchasing is having an impact in imaging services. Population health is also beginning to change the way we normally have seen payment for imaging services. Employers are becoming directly involved in negotiating with providers to lower premiums. We are also seeing in the Midwest the emergence of “company clinics,” where employers bring in doctors and other practitioners to their sites and work directly with health systems for specific services. This is primarily preventive maintenance in nature. RT: Are these employer-based physicians doing any imaging or is that contracted with third parties for those services? Vasquez: So far, they are not doing any medical imaging in their clinics. We are seeing some insurance carriers doing some price shopping on behalf of these clinics. RT: Does this put more pressure on your organization to negotiate with these large employers? Vasquez: Yes, absolutely. We are adapting to this new competitive environment. RT: What are AHRA’s key organizational initiatives as you start your term as president? Vasquez: AHRA has been in existence for 40 years and throughout that time we have taken pride in developing products and services driven by our members’ needs. This is the foundation of our mission and that will not change during my tenure as president. I will continue to enhance our rich tradition of providing products and services to meet our members’ challenges. I also will make advocacy part of the fabric of our association, whether in keeping members informed of state and federal legislation impacting imaging or forming alliances with other imaging associations in support of their advocacy efforts. I plan to continue to highlight the fact that imaging administrators are the key decision makers on capital purchases and that our recommendations are almost always accepted by organizations. Networking is one of the greatest assets in our association among its members; we need to take our networking to the next level by exchanging information with other imaging industry associations. There is a tremendous talent within AHRA, and we need to continue to share that talent within the medical industry. After all, we are all in this together. RT: As incoming president, what message do you have for your colleagues? Vasquez: Stay the course of medical imaging management. Whether you are a longtime member or just entering the profession, do not let yourself be distracted by the indirect noise within the health environment. In addition to its huge clinical contribution to patient care, medical imaging has been a leader in information technology, with a tradition of being early adopters of new technology with proven developments such as PACS, voice recognition, and diagnostic equipment that has accelerated early detection of diseases. This has been made possible by the ingenuity of medical imaging administrators, their commitment and dedication to patient care. We need to remain on this course if we are to continue to make a difference. We need to continue to reinvent ourselves, to stay up-to-date with technology as well as with what is happening with legislation. I believe medical imaging has been under scrutiny within the past seven years, and we continue to thrive because we have a sound clinical record to show what we have accomplished on behalf of patient care. Knowing that resources are going to be scarcer, we have to be able to adjust our strategy and learn how to maximize available resources without compromising clinical outcomes. Finally, when pressure mounts, look in the mirror and remind yourself of the reason why you choose to be an imaging administrator.